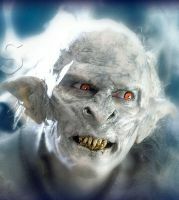 Orcs are said to be the result of the corruption of Elves. They do not like the light and prefer dark places like caves such as Moria. They generally don't even come out in daylight. They enjoy destruction and serve evil in Middle Earth such as Sauron and Saruman. Orcs in the service of Saruman chop down the trees of Isengard and even the edge of Fangorn Forest. They help him carve out the Caverns under Tower of Orthanc. Orcs in the service of Sauron actually join the party of Saruman's Uruk-hai that have captured Merry and Pippin. Orcs are part of the Minas Morgul army that overruns Osgiliath and then lays siege to Minas Tirith. Orcs stationed at the Tower of Cirith Ungol find Frodo after he was pricked by Shelob. The Orcs then end up almost completely killing each other off when a fight starts over Frodo's Mithril Coat.